Valentine’s Day is such a short “holiday”, that I don’t go all out with my decorating. I do like to give a nod to the day of love though, by adding just a few simple touches around my home. But – I want to add those small touches without spending a lot of money. That makes pillows the perfect choice! I even have certain spots, where people don’t sit very often, that I like to put seasonal pillows. Places like the bench in my breakfast area, the extra chair in the family room and on one of the side chairs in my dining room. 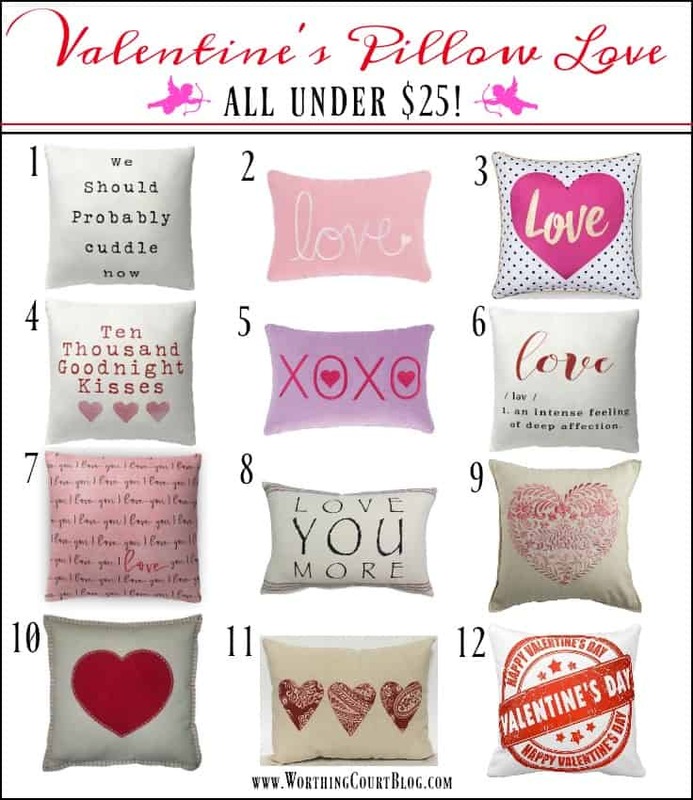 So, to save you time and make things easy, I’ve pulled together a group of twelve awesome Valentine’s Day pillows that cost under $25. I’m curious to know – which one is your favorite? Me? I can’t pick just one! « Easy And Affordable – Make A Valentine’s Wreath For Under $10! Love these pillows! I always have to do a little extra decorating for Valentines Day…..it’s my husband’s birthday. Thanks for the pillow ideas. I am going shopping today! Good collection of “heart-day” pillows! I’m with you…I like to do a little bit of “Valentines Decoratong” with oj l and red around the house! Thanks for the inspiration! Awww, I love these pillows. I think #9 and #11 are my favorites but love them all. Great post. I love hearts and these pillows are great for some Valentine’s Day decorating! All of them are too cute, but my favorite would have to be #11. I decorate for every holiday, even though my kids are long gone! I look forward to changing the house with pops of color and seasonal decor. My husband tells everyone that I even decorate for Arbor Day!! ? I like #1 because I could use it in our bedroom Year round, and #12 for the deep color! Love these! They would all look great on my couch! Oh how fun!!! I just LOVE the pillows! Thanks sooo much! I love 1,7, and 11, can I have them all??? I am sooo excited I found your blog, decorating southern farmhouse. We just purchased 80 acres with home, and you have inspired me so much. Thanks for sharing your talent with us. I really want all of them!! LOL. No really, I do! I can’t choose one or two! I had to get an under the bed storage container for all the pillows that live at my house! Thanks for the ideas. Pillows can brighten up any sofa. “Love” how you always find such affordable “holiday” goodies for us! Love these pillows– Just finished my mantle and these pillows would be a great addition to the breakfast room. Thanks for posting. A fact of life is that there is no such thing as too many pillows. That’s a great idea. Pillows are definitely an easy way to give a nice look for a short holiday! Thanks, Suzy. I absolutely your Valentine pillows! 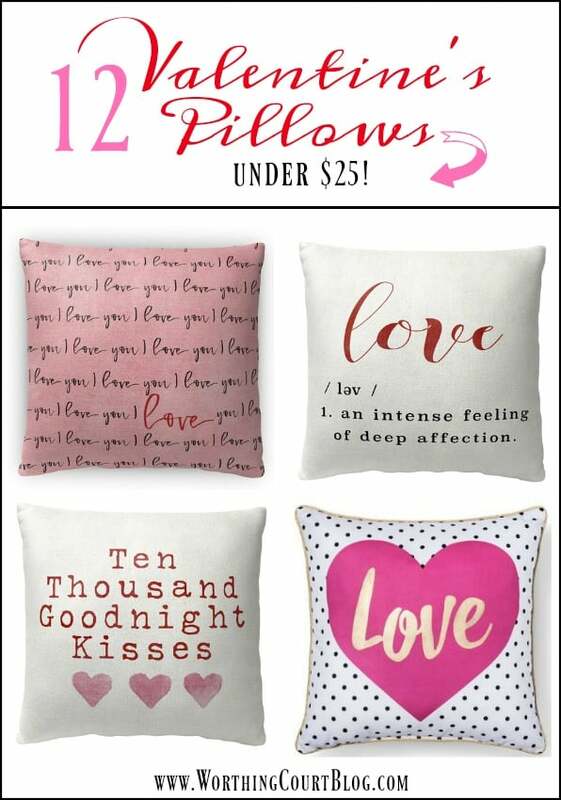 My favorite is #2 the pink “Love” pillow. I’d like to make it! … but I know I probably won’t get around to it. Valentine pillows–simple way to give a nod to the holiday. Maybe I’ll make one. I bet I even have a Valentine print somewhere in my fabric stash!